In 1955 in Hayward, California, Mary Andrade purchased a small plot of land next to her property on Willow Avenue and discovered some "nice looking" plants there. She decided they would look nice around Aldina Conto's house, and so moved the plants to her neighbor's property. A year later, police were knocking on Mrs. Conto's door with a subpeona. Police identified the plants as "marijuana," dug them up, and used them for training. Since neither Andrade or Conto knew what they were growing, neither was arrested or charged. Andrade's ignorance seems strange given the context of 1950s California, where marijuana was in the newspapers almost daily. 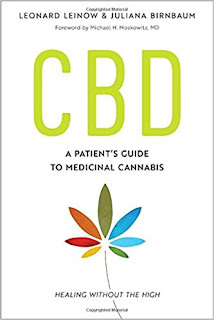 Reports of arrests, trials, dramatic raids, high school marijuana rings, small- and large-scale growing operations, smuggling rings, and photos of the plants filled the pages of the Long Beach Press-Telegram, Hayward Daily Review, Oakland Tribune, the San Mateo Times, and others. Cannabis plants were routinely discovered in California's urban areas. In June, San Francisco police officer William Spikes inexplicably took great care of "the biggest batch of marijuana we've found in years," in the words of a narcotics expert. Spikes apparently found the plants growing on his property and thought they were tomato plants. He "tended them carefully" until they refused to yield tomatoes and he attended a lecture on narcotics. Once his fellow law enforcement officials confirmed his suspicions, Spikes quickly cut and burned the five-foot plants. In July, Long Beach resident Sidney Silverstein and his wife mistook two large cannabis plants in their yard for weeping willows. They were even "happy over having such attractive shade trees." A gardener friend told them it was "marijuana," and police investigated. Although they estimated that the plants would make $4,000 worth of pot, the article reveals a key detail about the plants' origins that calls their estimation into question: The Silversteins had been feeding their parakeets birdseed, which often contained sterile hemp seeds. It is likely one of the non-sterile seeds sprouted and the Silversteins were simply enjoying the shade of tall, non-intoxicating hemp plants. In August, the Alphonse Gielen family of Van Nuys "nursed what they thought was a redwood tree in the patio of their home for five months." They later learned it was "marijuana." The article makes the shaky claim that the "seed was planted ... when it dropped from a Redwood pine." Even if the plant was cannabis, a more likely scenario is the sprouting of another renegade hemp seed. In September, the same month police pulled up Conto's plants, "[a]nother Long Beach woman suffered the embarrassment of finding a marijuana plant." Vetra Redford, apparently more astute than some of her fellow Californians, noticed that the five-foot hemp plant growing in her yard looked like one pulled up and photographed several days earlier. She called the police and they promptly destroyed hers, too. The same day Redford inquired about her plant, the wife of fellow Long Beach resident Henry Menke gave an eight-foot plant in her yard a "suspicious eye." The Long Beach Independent showed its familiarity with such stories when it reported that the plant was "discovered to be - you guessed it - marijuana." A police officer in the story tells residents "that marijuana may be easily recognized by its speedy growing habit" and its leaves that cluster in odd numbers. In October, Helen Huber of Pasadena "could not identify" a plant in her yard and took a twig to a local nursery, where it was identified as cannabis. She notified the police and the plant was pulled. Similar stories of unintentional cannabis growth can be found in newspaper records throughout the state during the 1950s, but this spate of reports from 1956 is rare. It shows that while plenty of Californians willingly grew marijuana in all kinds of places, cannabis also found its own way into the personal landscapes of many other people. Additionally, two recurring themes in these stories can help explain the presence of cannabis in these places. The most obvious theme is the climate. Cannabis, like most plants, grows best when supplied with plenty of sunlight and water. The California cities these plants sprouted in get plenty of sun, and the well-watered, well-tended gardens of Conto, Spikes, the Silversteins, and other city and suburb dwellers offered perfect habitats. Indeed, a 15-year-old nabbed in 1957 for growing marijuana in his bathtub "attributed his success" to La Mirada's "wonderful desert climate" (1). While cannabis grew in nearly every state in the 1950s, La Mirada and many other parts of California had - and still possess - a particularly cannabis-friendly climate. Another theme is the plants' description. In each of the above examples, the plants in question grew to a minimum height of five feet. 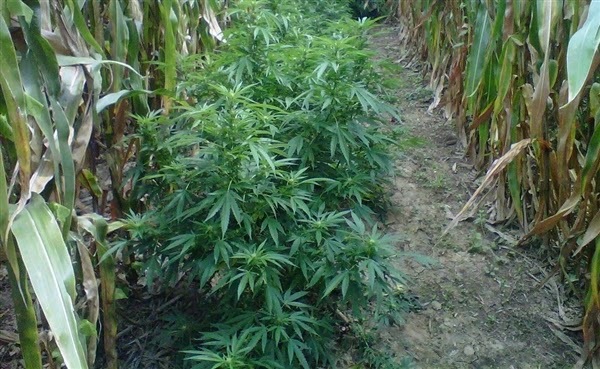 Strains of cannabis that produce marijuana grow far shorter, because they are not bred for long fibers. Had the Silversteins cut and dried all the leaves off their hemp trees and tried to sell them on the black market, they probably wouldn't have gotten much. Dried hemp leaves, missing the all-important resin present on marijuana plants, won't get anyone high. Then there's the source issue. Where did the seeds come from? The source is only explicitly stated in the case of the Silversteins. Hemp seed was commonly used in bird seed back then (2). In many cases of unintentional or apparently random cannabis growth, people or birds or wind likely scattered hemp bird seed. But in other cases, like in that of Andrade's next-door lot, it is possible someone intentionally planted the seeds. Urbanites in California and across the country planted marijuana seeds in vacant lots (3). Since law enforcement did not distinguish between hemp and marijuana in the fifties (and rarely does today), they probably pulled up and burned thousands of non-intoxicating hemp plants. 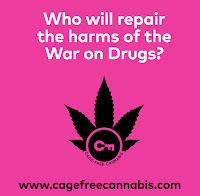 With marijuana raids and busts in the headlines and lawmakers calling for the death penalty for drug dealers, it is surprising that no one was arrested in any of the above cases (4). In these situations, law enforcement determined that only the plants should be punished, because they could potentially attract unwanted attention from "addicts" or dope slingers. Nature was not where it was supposed to be, and it was nobody's fault but nature's. If hemp plants could talk, they'd probably complain about years upon years of "plant profiling." Disclaimer: If you can hear plants talk, you're probably not smoking hemp. "Taboo Plants: Marijuana is Found," Hayward Daily Review, September 18, 1956. 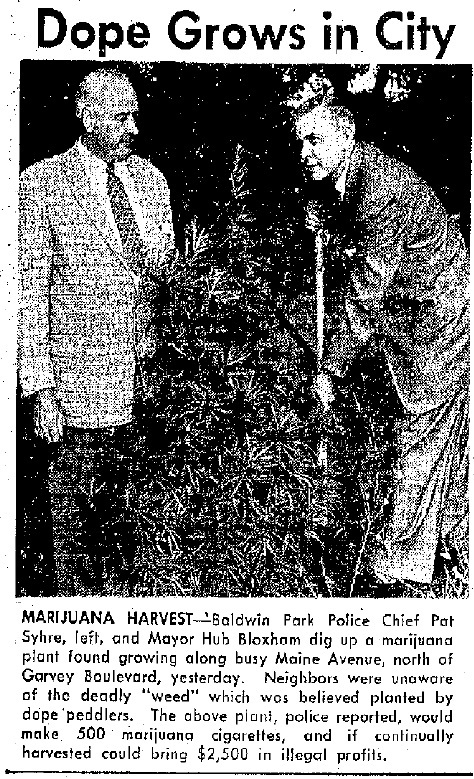 "Officer's Pet Plant Turns Out To Be Marijuana," Bakersfield Californian, June 28, 1956. "$4,000 Trees Weren't 'Weeping Willows,'" Long Beach Press-Telegram, July 19, 1956. "The Light and Heavy Sides of News Today," Corona Daily Independent, August 9, 1956. "Another Woman Finds Overgrown Marijuana," Long Beach Press-Telegram, September 27, 1956. "2 More Marijuana Shrubs Rooted Up by L.B. Policemen," Long Beach Independent, September 28, 1956. "Strange Plant Proves to Be Marijuana." Star News (Pasadena), October 8, 1956. 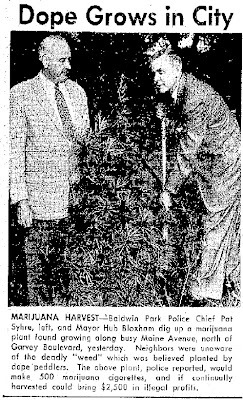 PHOTO: "Dope Grows in City," Star News (Pasadena), October 12, 1956. 1. "Nab La Miradan, 15, on Dope Charges," Long Beach Press-Telegram, October 31, 1957. 2. See also: "Bird Seed Field Found To Be Dope Producer," Woodland (CA) Daily Democrat, August 12, 1933. 3. Zachary Falck, Weeds: An Environmental History of Metropolitan America, Pittsburgh, PA: University of Pittsburgh Press, 2010, 76-89. 4. "Senate Crime Prober Asks: Penalty of Death for Dope Peddlers," Long Beach Press-Telegram, June 18, 1951.